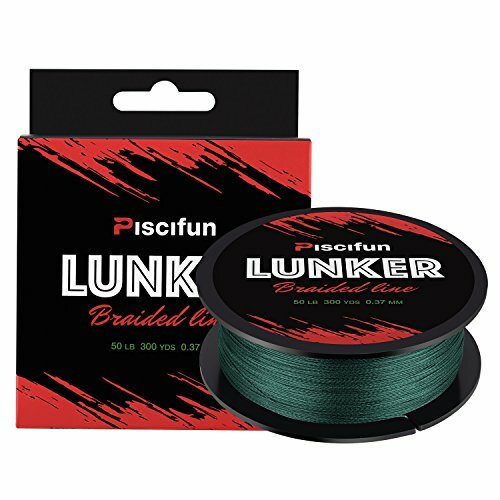 Piscifun Lunker braid line features with high quality Netherlands material. Thinner diameter and super strong power - Feel smooth as silk and exceptional abrasion resistance. Ultra Sensitive - Zero stretch and low memory make the line fantastic to feel the light bites. Silent - Smooth surface design reduces friction and line noise, allowing you to fish with stealth and silence. Enjoy your time on water! THINNER DIAMETER - Piscifun Lunker braided line is undeniably the best fishing line in terms of tensile strength. Netherlands material, stronger lbs testr diameter and precise braid crafts, help you downsize diameter without sacrificing strength. LOW MEMORY - Piscifun braided fishing line has very little to no spool memory and does not untwist like mono, which makes it fantastic for spinning reels. It is a great tool for presentations where strength and sensitivity are paramount. ABRASION RESISTANCE - Unique finesse Netherlands material with utilizing coating make the braid line exceptionally thin diameter and stand up to abrasion. Provides better color retention properties than ever before. SENSITIVITY - Thanks to its zero stretch, the braid line transmits information from your lure better than any other type of fishing line. You can feel light bites, when your lure ticks bottom, and tell if weeds or other debris has fouled your presentation. FIGHTING ABILITIES - Lunker fishing line slices through vegetation like a knife, which is a big benefit when you're hauling big bass and other trophy fish from heavy cover. Its zero stretch and amazing strength also help horse fish from harm's way in a hurry.